I've managed to take pictures of miniatures done so far this year. Once again I was only painting what I could find that was primed, due to recent poor spray painting weather. 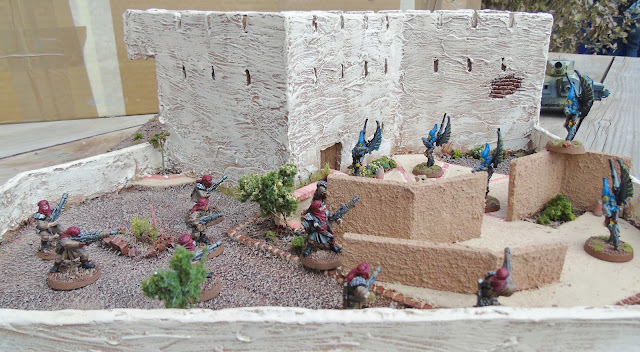 First up are nine of the old metal Tallarn(?) Imperial Guard models. I've officially decided to quite painting my sci-fi round base sides green. 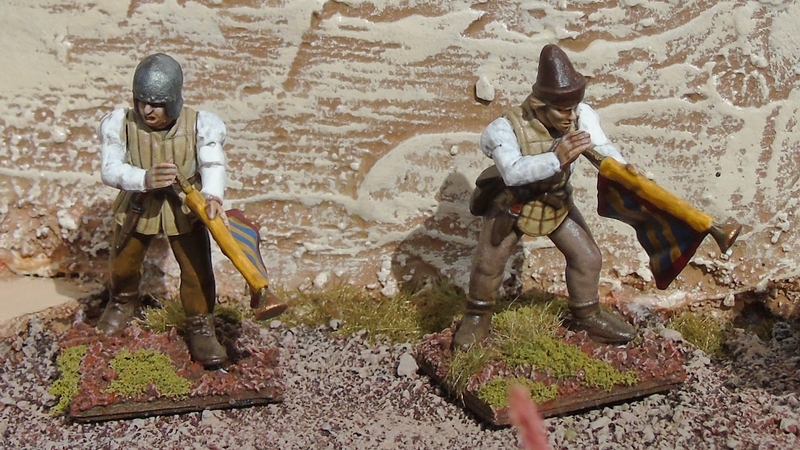 Here are two Perry plastic horn blowers that I painted up for my Burgundians. I have no idea if Burgundians even liked to blow on horns. Here's a mostly paper Leman Russ 40K tank. I didn't make the paper parts. I bought it off eBay many years ago and understood the incredible price when I opened the box. Only the center core piece is official model. You'll probably notice that I didn't do any detailing inside the left inside quarter panel. Here's five Eldar models with winged jet pack things. Here they are looking at the wall. 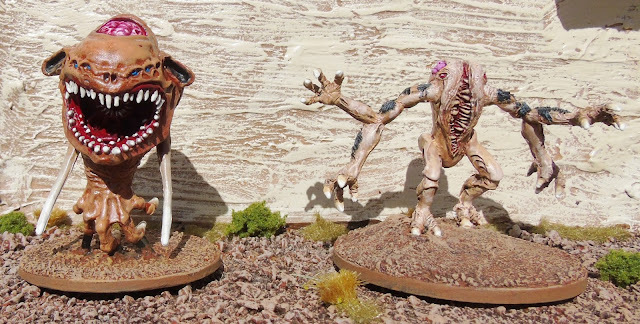 Here's a couple ugly monsters: an ugly flying thing from the OOP Doom board game and a Gug from Reaper miniatures. The Doom monster had a mouth in it's mouth, which was a pain to paint. Lovecraft wrote that Gugs have black hair. I wish he had imagined brown hair as it would have looked much better. Here's a coffin I found in my junk box. Here's all the colonial terrain I've recently made. If you look at the top of the blockhaus, you'll notice I forgot to make a hatch to get on the roof. The local gang used the pieces for our first game of Pulp Alley. Pulp Alley is quite enjoyable. Till next time, when a bunch of pagan Rus, a few dogs, some Squats, and a handful of Dacians should be done. That guardsman shot fighting through the square to drive back the Eldar is great. I have a lot of love for the Tallarn figures. Pity they weren't supported much beyond the single squad and heavies. FW did add a few nice things in a different scale though. That Gugs is also a great piece. As always, a great mix of well painted figures. I always wondered where that weird doom monster came from...now I know thanks. Nice collection of figures, Tallarn guard look really good! Excellent work, love your splendid Burgundians! Very nice work. I'm drawn to the 40K stuff, since I'm starting down that road myself. 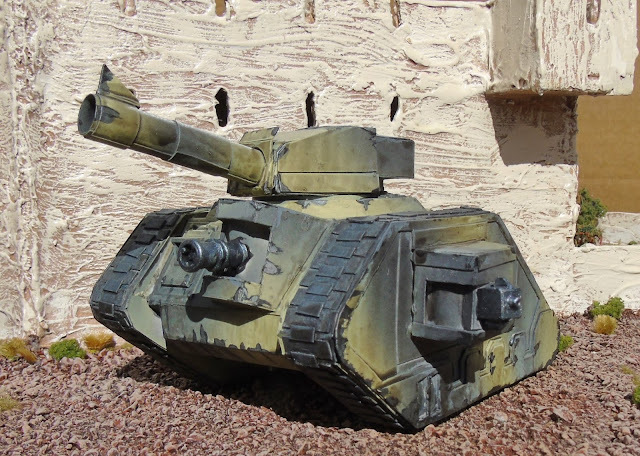 Having built a Leman Russ recently I can say the paper parts look quite good. I also love that Gug. Keep up the good work. All fabulous, but the monsters rather caught my eye, lovely work Sir. Excellent model painting on your eclectic collection of figures.